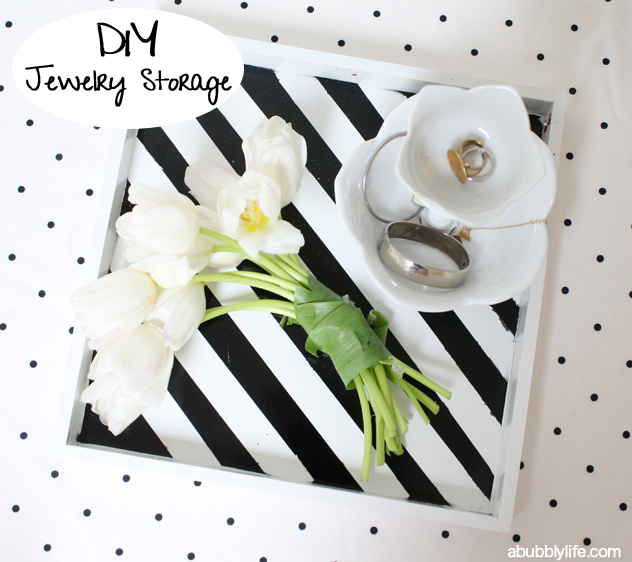 Making your own jewelry organizer (or use it to organize anything) is very easy to do and all my supplies were thrifted except the glue, of course! 1) Glue the smaller part of the candlestick to the middle of the large bowl, leave a heavy book on top to set for an hour. 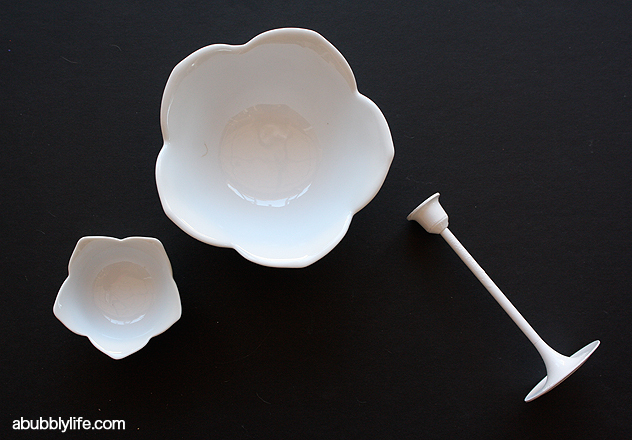 2) Glue the small bowl on top of the candlestick, leave a heavy book on top to set for an hour. 3) You are done! It would look great on a dresser or on your bathroom counter. Or use it in an office for storage! Carissa’s package to me was HUGE and she included all sorts of crafty things and GLITTERRR!! (clearly, she read A Bubbly Life 😉 It was so fun to get a package of crafty goodness in the mail! My first time around in Package Pals I did a Star Wars print for a new Momma! Check it out if you are a Star Wars fan- the printable is free- The Force is Strong With This One! 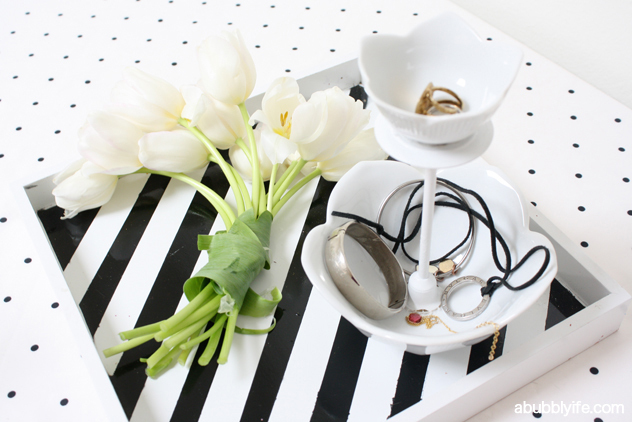 You can find the very easy to do striped tray DIY here! Hi! 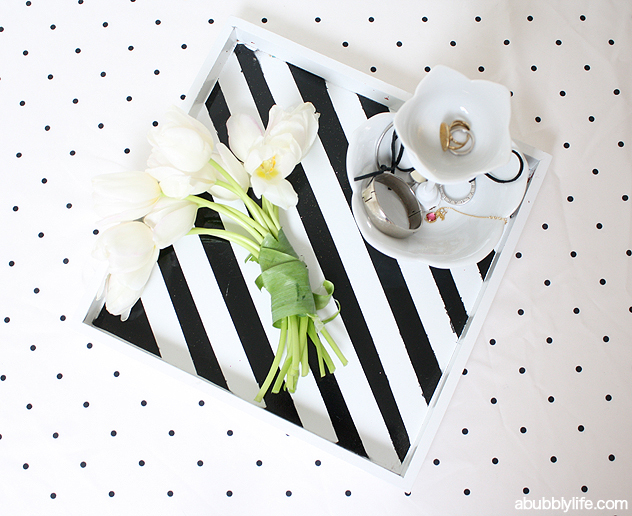 Is there a tutorial for the black and white tray? Love it! You have a lovely blog, full of inspiration. File you to enjoy with your ideas and not miss. Greetings.